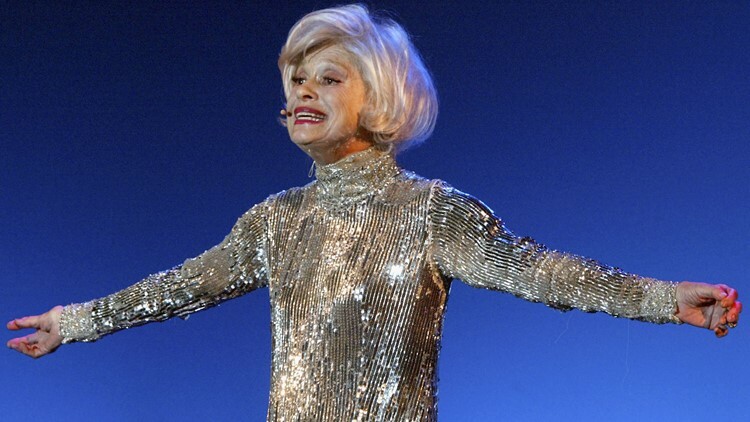 Actress Carol Channing performs at the opening night of her show 'Razzle Dazzle' held at the Los Angeles Gay and Lesbian Centre Theatre on July 23, 2004 in Hollywood, California. The actress, best known for her role in almost 5,000 performances of 'Hello Dolly,' died of natural causes in California. RANCHO MIRAGE, Calif. — Carol Channing, the lanky, ebullient musical comedy star who delighted American audiences over almost 5,000 performances as the scheming Dolly Levi in "Hello, Dolly" on Broadway and beyond, has died. She was 97. Publicist B. Harlan Boll said Channing died of natural causes at 12:31 a.m. Tuesday in Rancho Mirage, California. Boll says she had twice suffered strokes in the last year. Besides "Hello, Dolly," Channing starred in other Broadway shows, but none with equal magnetism. She often appeared on television and in nightclubs, for a time partnering with George Burns in Las Vegas and a national tour. Her outsized personality seemed too much for the screen, and she made only a few movies, notably "The First Traveling Saleslady" with Ginger Rogers and "Thoroughly Modern Millie" with Julie Andrews. Over the years, Channing continued as Dolly in national tours, the last in 1996, when she was in her 70s. Tom Shales of The Washington Post called her "the ninth wonder of the world." Messages of love and appreciation lit up Twitter early Tuesday, with the League of Professional Theatre Women saying Channing "was a gift of inspiration to so many." Fans who saw her work also took to social media, calling her a "firecracker" and saying she was "matchmaking for the angels now." Channing was not the immediate choice to play Dolly, a matchmaker who receives her toughest challenge yet when a rich grump seeks a suitable wife. The show, which features a rousing score by Jerry Herman that's bursting with joy and tunes like "Put On Your Sunday Clothes," ''Before the Parade Passes By" and "It Only Takes a Moment," is a musical version of Thornton Wilder's play "The Matchmaker." Theater producer David Merrick told her: "I don't want that silly grin with all those teeth that go back to your ears." Even though director Gower Champion had worked on her first Broadway hit, "Lend an Ear," he had doubts about Channing's casting. She wowed them in an audition and was hired on the spot. At opening night on Jan. 16, 1964, when Channing appeared at the top of the stairs in a red gown with feathers in her hair and walked down the red carpet to the Harmonia Gardens restaurant, the New York audience went crazy. The critics followed suit. "Hello, Dolly" collected 10 Tony Awards, including one for Channing as best actress in a musical. At the age of 7, Channing decided she wanted to become an entertainer. She credited her father with encouraging her: "He told me you can dedicate your life at 7 or 97. And the people who do that are happier people." While majoring in drama and dance at Bennington College in Vermont, she was sent off to get experience in her chosen field. She found a job in a New York revue. The show lasted only two weeks, but a New Yorker magazine critic commented, "You will hear more about a satiric chanteuse named Carol Channing." She said later: "That was it. I said goodbye to trigonometry, zoology and English literature." For several years she worked as an understudy, bit player and nightclub impressionist, taking jobs as a model, receptionist and sales clerk during lean times. Landing in Los Angeles, she auditioned for Marge Champion, wife and dance partner of Gower Champion who was putting together a revue, "Lend an Ear." Marge Champion recalled: "She certainly was awkward and odd-looking, but her warmth and wholesomeness came through." Channing was the hit of "Lend an Ear" in a small Hollywood theater, and she captivated audiences and critics when the show moved to New York. As the innocent gold digger in the musical "Gentlemen Prefer Blondes," her stardom was assured. One reviewer reported she "hurls across the footlights in broad strokes of pantomime and bold, certain, exquisitely comical gestures." The show's hit song, "Diamonds Are a Girl's Best Friend," became her signature number. Over and over again she returned to the surefire "Hello, Dolly," which earned her $5 million on one tour. She considered Dolly Levi "a role as deep as Lady Macbeth," but added that "the essence of her character was her unquenchable thirst for life." That description fit Carol Channing, who attributed her sunny optimism to her lifelong faith in Christian Science. Others who have played the role include Pearl Bailey, Phyllis Diller, Betty Grable, Ethel Merman, Martha Raye, Ginger Rogers and Barbra Streisand, who played Dolly in a 1969 film version directed by Gene Kelly. Bette Midler won a Tony Award in the role in 2017. In 1956 she married a television producer, Charles Lowe, who seemed like the perfect mate for a major star. He adopted Channing's son and supervised every aspect of her business affairs and appearances. He reportedly viewed every one of her performances from out front, leading the applause. "The only thing about control freak victims is that they don't know who they are," she told The Washington Post. "It's taken me 77 years to figure that out. I was miserable. I was unhappy. And I didn't realize it wasn't my fault. But I'm going to survive. I'm going to live. I'm free." Lowe died after a stroke in 1999. Channing moved to Rancho Mirage near Palm Springs, California, in 2000 to write her memoirs. She called the book "Just Lucky, I Guess." Her parents asked: "Do you?" She responded: "Oh no, I pet them."